If Sarah McCoubrey has ever feared change, it’s not reflected in her paintings. Her previous solo show at Locks Gallery, in 2012, undoubtedly surprised some gallerygoers expecting her carefully observed oil paintings of country landscapes just barely marred by industrial intrusions. McCoubrey instead offered a powerful, if surreal, indictment of human attacks on the environment. Among her sublimely rendered dystopian images: a flying oil tank, chunks of land that appeared to have been blasted into the air, and potatoes retrofitted as helicopters and robots. McCoubrey’s new series of paintings at Locks, all in gouache or gouache and acrylic, is another about-face — to me, the most dramatic. 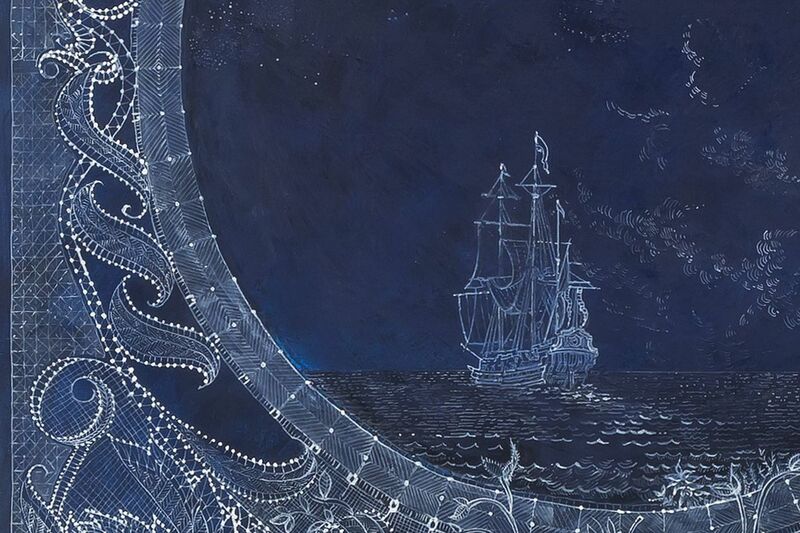 The delicate touch in these recent images of lace-framed sailing ships is the only giveaway that they could be hers. It turns out McCoubrey, a professor at Syracuse University, spent a sabbatical in Belgium in 2014 as the centennial of WWI was about to begin. Infatuated with the handmade Belgian lacework she saw at Brussels’ Fashion and Lace Museum, she borrowed the look of the traditionally feminine fabric for paintings describing the heroism and savagery of the war. Some of McCoubrey’s narratives take the form of wooden ships at sea, as seen in Indigo Stars. Others address the deprivations endured by Belgians (and their lace-making industry) during wartime rationing — painted on flattened butter wrappers. The faintness of McCoubrey’s new paintings is reminiscent of old handwritten letters and of drawings or prints exposed to sun over the years. It perfectly suits these images from the past, inviting you to slow down, look carefully, and imagine life in this fraught time from history. Through March 29 at Locks Gallery, 600 Washington Square South, 10 a.m. to 6 p.m. Tuesdays through Saturdays. 215-629-1000 or locksgallery.com. The Icebox Projects Space’s always engrossing 20/92 Video Festival is coming up next week, and if you blink, you’ll miss it. Exhibition dates are March 15 to 17. This annual curated event favors submissions that push boundaries. This year’s fest includes new works by Tobi Aremu, Frances Beaver, Isabel Beavers, M. Asli Ducan, Maggie Hazen, Nina Isaacson, David Kessler, Yue Nakayama, Chris Papa, Emily Sasmor, Tracy Abbott Szatan, and Levester Williams. They’ll play continuously during gallery hours. Screenings noon-6 p.m. March 15-17, Icebox Projects Space, Crane Arts, 1400 N. American St., iceboxprojectspace.com. Barry Goldberg, David Goerk, and Steve Riedell have all shown paintings many times since the 1990s at Larry Becker Contemporary Art, and now the gallery is celebrating a kinship among them that, to date, has never been formally acknowledged. The group exhibit Peace Shake offers new and recent works by all three. All three exhibitors make non-objective paintings and live — or have lived — in Philadelphia. (Goerk moved to New York years ago.) Beyond that, the most obvious thing they have in common is experimentation with non-traditional supports, blurring the line between painting and sculpture. Goldberg started out in the 1980s painting pigmented encaustic onto woven strips of canvas mounted to stretchers that were exposed in the finished works, like armatures. He now now paints on traditional linen over panel-backed stretchers. His paintings borrow their compositions and colors from a vast array of things, from the curves of mid-century furniture to product packaging to a Rothko painting. Goerk, who painted fantastical forms on traditionally stretched canvases in the 1980s, has been more recently been painting on small, semi-geometric wooden constructions. Riedell has pushed the limits of what can be considered a painting as far as he can while producing works that still speak to the power of color to stir memories. His endearingly lumpen and life-vest orange “Untitled (Orange)” is one of the show’s highlights. Through March 30 at Larry Becker Contemporary Art, 43 N. Second St., 11 a.m. to 5 p.m. Fridays and Saturdays. 215-9255389 or artnet.com/galleries/larry-becker-contemporary-art. Over the years, I’ve noticed that woodworkers hew to their own values, prizing technical finesse over artistic vision. By and large, they seem to occupy a separate world from sculptors like Ursula von Rydingsvard or Martin Puryear, who employ wood as a primary material in their allusive personal expressions. Branching Out, an exhibition of works in wood at Swarthmore College’s List Gallery, is mostly in the technical finesse camp, with gorgeously made pieces. Anyone who enjoys seeing wood coaxed to its fullest physical possibilities should not miss this show. The works are from the personal collection of former Center for Art in Wood director Albert LeCoff and his wife, Tina. One that caught my eye was Albert LeCoff’s first purchase, from 1985, a turned and textured vessel by William Hunter. Other standouts include Bud Latven’s blue-stained vase and Michael Scarborough’s Pouring Vessel with Handle. Coming closest to “sculpture” were works by Susan Hagen, including a homeless figure lying on a bench, entirely enclosed in a sleeping bag. Through March 24 at List Gallery, Swarthmore College, 500 College Ave., Swarthmore, noon to 5 p.m. Tuesdays through Sundays. 610-328-7811 or swarthmore.edu/list-gallery.